Artist and educator, Dorothy Geneva Simmons was born in Woodland, California on July 19, 1914. She attended the University of California, Berkeley, where she completed a Bachelor’s and a Master’s degree in fine arts in 1940 and 1943, respectively. While she was completing her studies, she met John William Skelton, ­­­­­an officer in the U.S. Army Air Corps. The two were married in July 1941. In 1944 Skelton became a senior research analyst for the Military Intelligence Division of the War Department at the Pentagon in Washington, D.C. In 1947 she volunteered for service with the MFAA Restitution Branch of the Office of Military Government, U.S. Zone (OMGUS) for Hesse in Wiesbaden, Germany. In addition to her duties, she volunteered to teach art to German students in the town of Bad Nauheim, Germany. She also helped prepare an extensive catalogue for an exhibition of drawings and paintings by Rembrandt held at the Wiesbaden Central Collecting Point in May 1948. In 1948 Skelton was a civilian member of The Monuments, Museums, and Fine Arts (MMFA) project, also known as the Monuments Men. Millions of pieces of art were confiscated by the Germans during World War II; many pieces were found at the end of the war by the Allied troops and art historians and professionals. Dorothy Skelton and many others worked to restore the art, repair if necessary, and then locate the original owners with the intent to return the pieces to them. Skelton’s time with the project is documented in government papers. Upon her return to the United States in late 1948, Skelton began a long and rewarding career as an art educator. She influenced the lives of hundreds of students at the Dayton Art Institute and Lincoln Elementary School, both in Dayton, Ohio, and the University of Virginia School of Continuing Education in Charlottesville. She also continued to produce her own works of art, which were included in group shows in California, Colorado, Ohio, Washington, and Virginia. An active member of her community, she was a black belt in karate, a maker of handmade hats, a volunteer art consultant, and an independent genealogical researcher. Her book, The Squire Simmons Family, 1746-1986, an in-depth chronology of her own ancestors, was published in 1986. She was a member of the National Association of Pen Women, the American Association of University Women, the American Association of Museums, the College Art Association of America, and a life member of the National Society of Arts and Letters. Dorothy Skelton died in Culpeper, Virginia on November 7, 1999. She was one of the founders of Windmore Foundation for the Arts. Her extraordinary legacy of providing art education to the next generation lives on in the form of the Windmore Dorothy Skelton and Millie Lane Arts Scholarship. Established in 2002 by Windmore, the annual scholarship is awarded to a graduating high school senior interested in pursuing a higher education in the visual or performing arts. Currently Dorothy Skelton’s painting depicting The Monuments Men is on loan to the Museum of Culpeper History in Culpeper, Virginia and has also been displayed previously at Fort Bragg, North Carolina. Millie was born December 6, 1938 in Trenton, New Jersey to George and Dorothy Allen. Millie was married for fifty years to Frederick “Ted” Earl Lane. Millie graduated from Mercer Hospital School of Nursing College, in Trenton, New Jersey, as a registered nurse. She worked as a nurse at Culpeper Hospital, an operating room nurse at Fauquier Hospital, and as an occupational health nurse for Southland, GM Power Train, Department of Corrections at Camp 11 and Coffeewood Correctional Center. She had a 40 year career as a nurse, earning many awards for creative and innovative programs, a place in Who’s Who in American Nursing. After her retirement from her nursing career, Millie became very active in art. 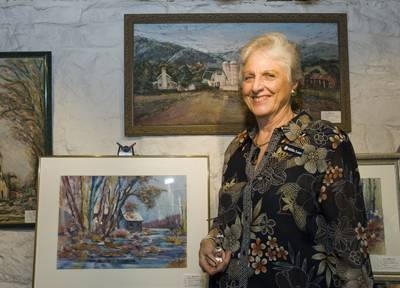 She was an a member of Brushstrokes Gallery of Fredericksburg, Fredericksburg Center for Creative Arts, Wide River Gallery in Colonial Beach, and had works in Mike and Jake’s Restaurant, Caroline St. Café in old town Fredericksburg, as well as Orange Art Center, Village Frame and Gallery, Culpeper Depot and Library, and Wilderness Library and her home gallery. She was an active member, as well as the Chair or Co-chair for many years, of the Lake of the Woods Visual Arts Council. She was an active member and teacher of Artists of Windmore and The Fredericksburg Center for the Creative Arts. Millie also enjoyed being outdoors, farming, horses and being at the beach which all influenced her choice of content for artwork. Millie passed away on December 4, 2010. Her art and memory lives on through the Windmore Dorothy Skelton and Millie Lane Arts Scholarship and the many venues where her work is displayed.